The flagship day of the Nottinghamshire Senior League saw history being made, with the both finals being played on the same day and also the first ever on a 4g pitch to which hoppers gave back positive remarks. With the Junior Final kicking off at midday, this gave a few hoppers time to get a few double matches in around the East Midlands area and the 4pm kick off of the Senior Final saw players and officials from the league midday kick offs to attend, but what great value those had for £3 for both matches and a free programme. On arrival at 9.30am, it gave me time to sort bits and bobs out, before at 10.15am to go to the players gate to meet and greet, at 11.15am both teams had given me their line ups and these went off to print for free teamsheets to be given out free of charge to spectators, Hazel went round the first match with the raffle for our new charity for next seasons blog, I will mention more later. It was soon 2-0 after 15 minutes, when KEIRON WHEAT hit a 30 yard shot in to the top corner of the net, it was at this point I feared for Burton Joyce, but Burton Joyce kept playing their football and got a deserved goal on 20 minutes, when JACK HOPPER guided his header home to make it 2-1. On 39 minutes, MARKELL BAILEY won the ball and fired home to restore his teams two goal advantage, but Burton Joyce were not finished as they hit back when just before half time RICKY GARNER turned the ball in to the net to make it 3-2. 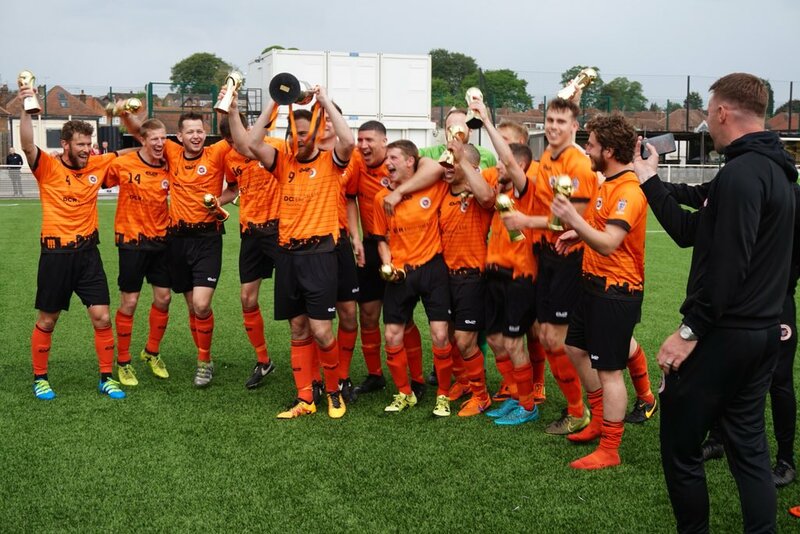 The Second Half was just as good as the first but no further goals were scored, so the team in Orange, Woodthorpe Park Rangers collected the Junior Cup in their first season in the Nottinghamshire Senior League. During the 2 matches, referees from Mansfield, Newark and Nottingham had a charity penalty shootout for Prostate Uk, sadly I didnt see it, as I was on players gate duty to do meet and greet for the Senior Cup Final and then on the main gate, so missed some of the Final, though could hear what was going on. 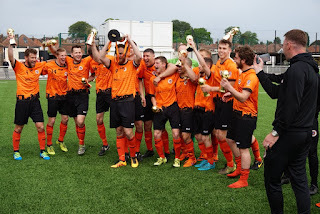 Newark Flowserve FC playing in Orange, had already won the Premier Division and went in to the Senior Cup Final as favourites and were quick out the blocks as the game was a bit one way traffic and were soon in front after 16 minutes, when ELLIOTT KING smashed home a penalty. On 37 minutes, as Hazel passed with the 2nd raffle of the day, ELLIOTT KING helped himself to his second goal of the day to double Flowserve;s advantage. On the hour, it was game over as Flowserve added a third through MICHAEL ATTARD and on 86 minutes, ELLIOTT KING completed his hat trick to make it 4-0. On full time, I was asked to present Newark Flowserve with their trophys and the cup.